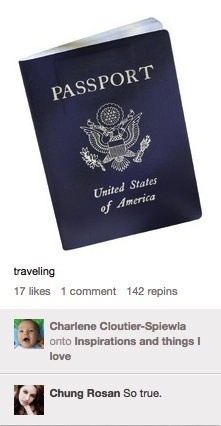 Maybe Chung is a customs agent or homeland security offer with x-ray vision and was speaking to the validity of this passport. "So true" as in "this is a real passport." Doubtful. I'd love to see what else Charlene has pinned to her "Inspirations and things I love" board. Maybe a chair? Bowl of grapes? Blank piece of paper?